The Arcade Ball iPhone, iPod Touch, and iPad app gives you all of the fun of playing this quintessential arcade game, but you don’t have to deal with high entry fees, crowds, and bad pizza. A free download from the iTunes App Store, you employ physics-controlled gestures to earn points, tickets, tokens, and prizes. 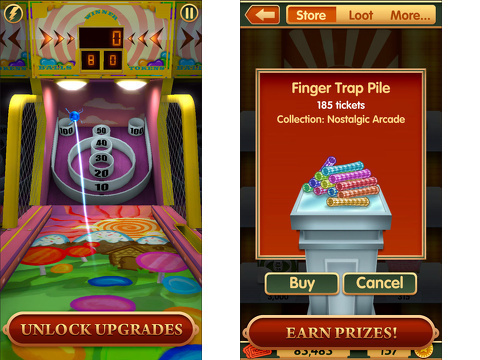 The Arcade Ball iPhone app syncs with your Game Center account, but also offers several other opportunities to connect. You can log-in to a Mobage account, sign in with Facebook, or play as a guest. You are assured that no posts will be made to your Facebook timeline without permission. The interface is busy and filled with promotions. There is a tongue-in-cheek declaration that there is “150% less branding.” It is a free download, but you must pay with your patience for the over-the-top marketing. 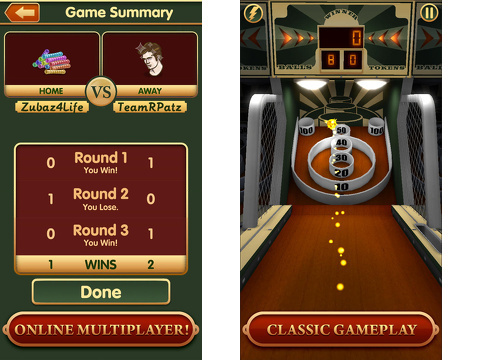 There are two game modes in the Arcade Ball iPhone app – play or versus. In the play mode, you just play the game and have your own experience. With versus, you can play against a friend or a random user. The physics-controlled gestures are intuitive and accurate. You swipe and flick to throw the ball. At the same time, you tilt your iPhone to add spin. As you earn points, you can redeem power-ups and earn bonus points. The power-ups and bonus choices are fairly limited, as this is such a simple game. But, nevertheless, it is fun to flick your ball into a highlighted cup and earn extra points. The gestures and tilt are very responsive, and they make the experience remarkably comparable to a real-life game. The graphics are nice and engaging. At the top of your screen, you can monitor the number of points earned, number of balls available, and tokens earned. You redeem your tickets in an in-app store with graphics of the silly prizes that fall apart in the car on the way home. On the home screen, there is a free daily spin to collect a prize. The Arcade Ball iPhone, iPod Touch, and iPad app is a great, fun download for you and your kids. It’s simple and doesn’t require extensive explanation – even for little kids. And, as a bonus for parents, it’s like going to Gattitown without the buffet, sticky floors, and germs. AppSafari review of Arcade Ball was written by Jenni Ward on October 17th, 2013 and categorized under App Store, Arcade, Free, Fun, Games, iPad apps, Kids, Universal. Page viewed 3946 times, 2 so far today. Need help on using these apps? Please read the Help Page.